“Sometimes I relieve on the Surgical Lines: It is there the horrible sights are; you would not believe me mother if I tell you about what I have seen and gone through.” Frances Cluett in a letter to her mother, 1916. Several years ago I was introduced to the legacy of Frances Cluett. I had heard of her as a long-serving teacher in Belleoram, next door to St. Jacques; however, I didn’t know of the role she played as part of the Newfoundland effort to fight The Great War (1914-18). After reading the book Your Daughter Fanny – The War Letters of Frances Cluett, VAD edited by Bill Rompkey and Bert Riggs, I was struck by the enormous effort she gave and the courage she exhibited in volunteering to serve. As I read her letters home which had been preserved by family members, it was like being a fly on the wall observing Fanny, as she was known, as she traveled from Belleoram to St. John’s, to New York, to Europe, her observations of what was happening around her and those things she wanted to stay in touch with at home. Memorial University has recently named a wing of its new Macpherson College residence after this local hero. On October eighth, 2014, Premier Davis presided over the official opening of the residence which honoured Frances Cluett as one of Memorial’s earliest graduates and war veteran by naming one of the two wings of the residence after her. The other was named after John Shiwak, an aboriginal man from Labrador who gained quite a reputation during the war as a sharpshooter. Unfortunately John Shiwak was a victim of the war. He died in action. Frances Cluett was born at Belleoram on June 25, 1883. Her parents were Arthur M. Cluett (1851-1897) and Matilda Grandy (1855-1931). Both parents were born in Belleoram and died there. Frances had one sister, Lillian (1880-1938) and one brother, Arthur Samuel (1888-1963). Arthur married Margaret Dominix, of Bay du Nord in Fortune Bay. Frances died on November 12, 1969. Frances was educated in Belleoram. After she finished school there she became an assistant to the local school master, Mister Crant, in the one-room school which served all grades. 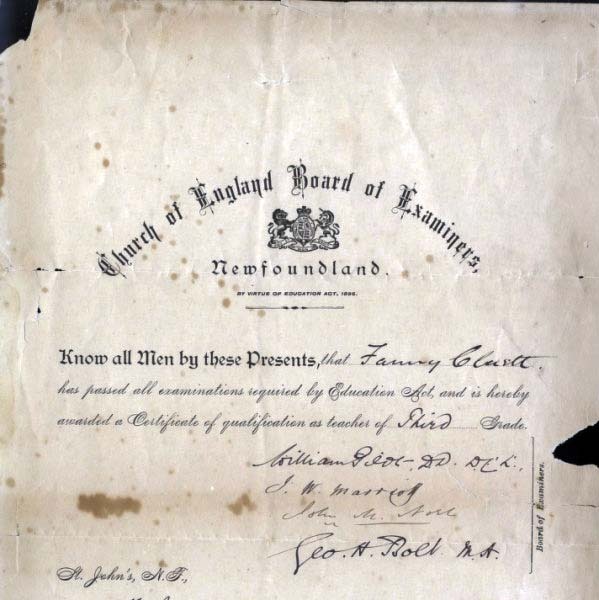 This experience led her to travel to St. John’s in 1901 to attend training to become a teacher. After basic training she returned to Belleoram and taught for fifteen years until at age thirty-three she volunteered for service overseas to assist with the war effort. 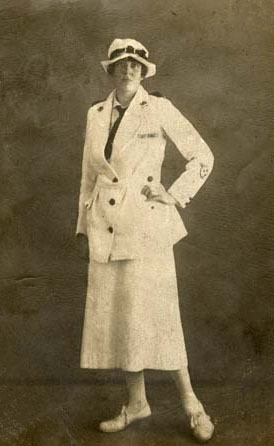 She had exhibited considerable interest in the war as shown by her support of the Women’s Patriotic Association Branch of Belleoram of which she became its first president. In the fall of 1916, after receiving a message form the Women’s Patriotic Association asking her to report for service, she left Belleoram on the S.S. Glencoe and travelled to Placentia where she continued the journey to St. John’s by train. There, she became a member of the Voluntary Aid Detachment (VAD) with the St. John Ambulance Corps. She eventually joined the British Expeditionary Force in France. In St. John’s she spent several weeks in training; after which she traveled by train to Port aux Basques, crossed the Cabot Strait to Nova Scotia and then by train again to New York City. Her trip across the Atlantic started in New York and ended in Liverpool, England. From there she traveled to London for more training for work in a military hospital. By the spring of 1917 she was stationed at the 10th General Hospital in Rouen, France, a hospital that dealt with general battle casualties. In 1919 when the war ended she volunteered to spend another year. This time she was assigned to a British Military Hospital in Turkey. After the war she spent some time travelling in Europe before returning to Belleoram in 1920. Cluett attended the Normal School in St. John’s after the war which qualified her for a teaching career. The Normal School eventually became the Faculty of Education within Memorial University making Frances one of its earliest graduates. She spent the rest of her life in Belleoram where she taught primary school and operated a small general store. 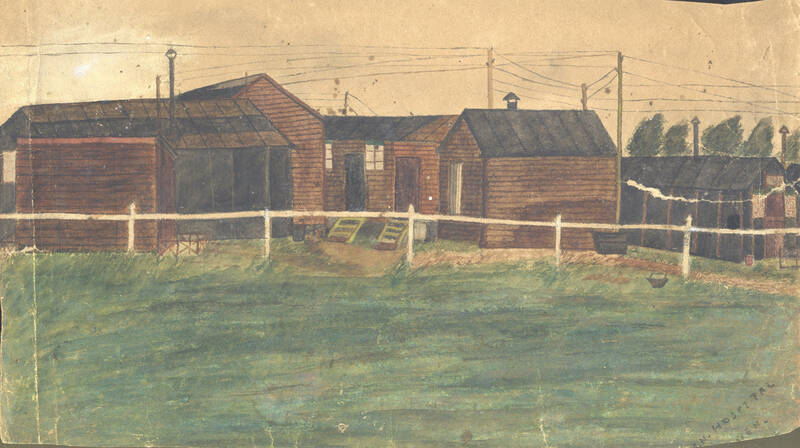 We know of the experience of Frances Cluett as a VAD nurse through her letters home, her photograph album and watercolour paintings all of which are now held at the Centre for Newfoundland Studies at Memorial University. The Frances Cluett Collection also includes two St. John Ambulance Brigade badges. There is also a German Iron Cross medal which was given to her by a severely wounded German major who was one of her patients in a camp nursing German prisoners of war. Just before he died he gave her his Iron Cross and helmet. In the collection there is also an autograph album completed during the years 1907 to 1910, and a small but interesting journal written by her as a lengthy letter to her sister Lilian in 1908 describing life in Belleoram. These letters, photographs, paintings, and writings give us insight into the life of one our own local heroes, who served as a VAD in World War I. During her four years of service, Nurse Fanny Cluett wrote letters to her mother and sister. 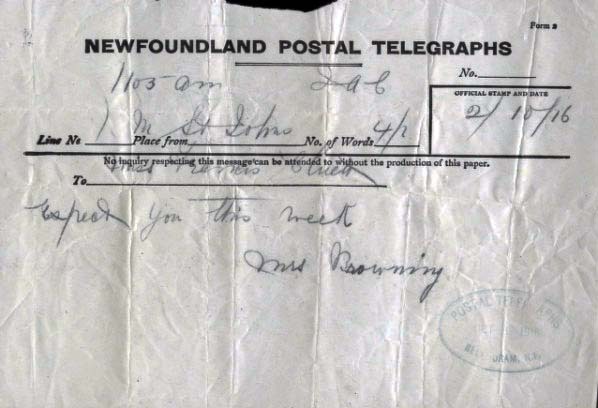 These letters dealt with her travel experiences, training, people she met, working conditions, the horrors of war and the incredible loss and suffering she witnessed as well as some of the Newfoundlanders she met there. In some letters she described the atrocities of war, the heroism of soldiers, and the despair she felt for so many young men dying so far away from their homes, including her cousin Vince Cluett. In a review of the book by Rompkey and Riggs, titled, In Search of the Fighting Newfoundlander, published in the Journal of Newfoundland Studies (2009), Martin Gerritsen said, “Cluett offers a view of the suffering. Supervising a ward of 26 beds, she often felt overwhelmed and guilty for not being able to provide adequate care. During major offensives the numbers of wounded could pile so high that many would die for the want of attention. Even for soldiers who survived their first few days in hospital, the road to recovery could be agonizingly painful and Cluett often cursed the harsh treatment methods used on severely wounded soldiers. Yet, amidst this sadness Cluett expressed surprise at her patients’ compassion and lack of self-pity, as even severely wounded soldiers tried to be upbeat and make life as easy as possible for the nurses around them.” p. 143. Below are short excerpts from her letters. You can read the letters in more detail at Memorial University’s Digital Archives by clicking on the Letter Links below. I have the care of five wards at night; so you can imagine I am kept a bit busy. I sometimes feel very, very, sleepy around the hours of one and two; but sleep must be sacrificed by all accounts, as one must keep a look out for all sorts of things, such as amputation bleedings, deaths, drinks etc. This is a very wicked world mother; you cannot realize what sufferings there are: Some of the misery will ever live in my memory: it seems to me now as though I shall always have sad sights in my eyes . . . I am going to church at 11:15 a.m. for I am so terribly tired. We are awfully busy, nearly killed since this last rush: if this war does not soon end there won’t be a man living on the face of the earth. It is brutal, it is cold-blooded murder; it is hell upon earth. Oh! If you could only see and go through what we do mother [sic]; it is enough to drive one mad. I have not said anything about poor V(ince). I got a letter from his mother and R(—) ; and will answer both shortly. Tell Aunt Sarah I shall do my best for her. Did she get my letter? I used to think that perhaps V— and I would spend our vacation together. I think of him when I see the drafts go up the line, headed by the Officers. I knew when he was sick that he must be more than slightly wounded, as he never once wrote me, otherwise I should have had a very long letter. It was the battle of Cambrai, he was wounded in. All our boys got knocked out. Gas was used a lot. Poor V—’s wound was gassed as well. I cannot for a minute realize that he is dead. Cluett’s last letter to her mother is dated November 21, 1920 from London just before she sets sail for Newfoundland. Related Sites you might enjoy visiting. I had heard of Francis Cluett… Did she live in the Cluett House/Museum in Belleoram?…I visited there about ten years ago…Thank you for providing such an detailed documentation on her life and legacy of this wonderful woman. Frances Cluett is indeed a descendant of John Cluett, one of the first settlers of Belleoram. That is who owned the house that is now a museum, Cluett House. She didn’t live there. As you can appreciate, the family had several branches, of which she was in one. There were quite a few Cluett’s in Belleoram at one time. 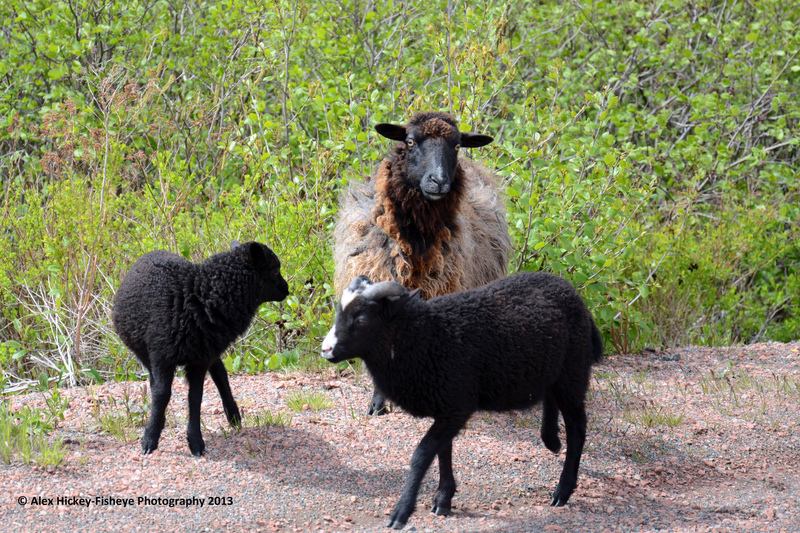 There was also a family of Cluett’s in St. Jacques. Many of the Cluett family moved to Massachusetts, as did many other families on the south coast on Newfoundland. Today in Massachusetts one can find the family name still vibrant. Thank you for the lovely article. Franis Cluett is my great grandmother. My grandfather, Rev. Veron Cluett, supplied all the documents to the archive, wonderful to have well documented family history. I will be sure to visit Cluett Hall on my next visit to Newfoundland. Could you add any further information on the Cluett’s of Belleoram and their connection to the Jensen’s of Harbour Breton…?? ?